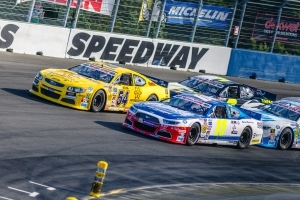 Tours Speedway, France - After climbing on the ELITE 1 podium for the first time in his career in the KNAUF 75 earlier today, Italian rookie Riccardo Geltrude (#7 Double-T by Nocentini Ford Mustang) completed is fantastic day at Tours Speedway by grabbing his first career NASCAR win in the ELITE 2 Whelen 75 with a perfect move on Thomas Ferrando (#37 Knauf Racing Team Ford Mustang) six laps from the Checkered flag. 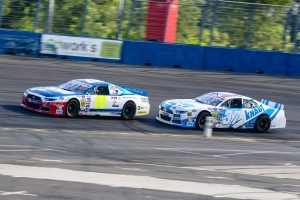 After two early restarts, pole sitter Stienes Longin (#11 PK Carsport Chevrolet SS) had to surrender the lead to a charging Ferrando on lap 34 and the second place to Geltrude a couple of laps later. The Italian quickly closed the gap and filled Ferrando’s mirrors with his black and gold Ford Mustang until lap 70, when he applied a textbook bump & run move in turn 4 to win the first race in his young NASCAR career. Geltrude also won the Rookie Cup classification. Ferrando crossed the finish line 1.5 seconds behind the leader, while Longin had the better hand on Salvador Tineo Arroyo (#54 CAAL Racing Chevrolet SS) for third, grabbing the pole for tomorrow’s race thanks to a fastest lap .005 seconds quicker than Geltrude’s. Gabriele Gardel (#24 PK Carsport Chevrolet SS) rounded out the top-5 ahead of Hugo Bec (#3 Tepac RDV Compétition Ford Mustang). 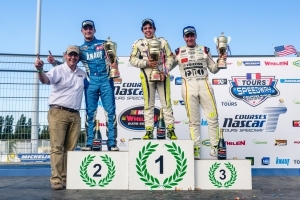 Renzo Calcinati (#12 Virgin Radio Double-T by Nocentini Ford Mustang) won the Legend Trophy in seventh completing a Double-T by Nocentini sweep, while Simone Laureti (#9 Double-T by Nocentini Ford Mustang), Paul Guiod (#73 Knauf Racing Team Ford Mustang) and Justin Kunz (#44 CAAL Racing Chevrolet SS) completed the top-10. 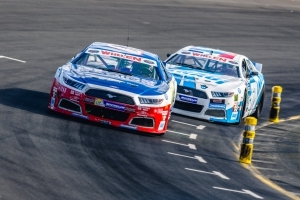 Lady Cup leader Arianna Casoli (#8 Vict Motorsport Ford Mustang) was involved in an accident at the start and had to retire early. The green flag for the ELITE 2 Michelin 75 will wave tomorrow at 10:30 am CET and the race will be broadcasted live on Fanschoice.tv (http://bit.ly/nweslive).